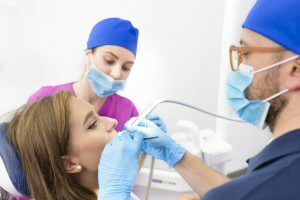 Root canal treatments have a notorious reputation for being one of the most dreaded and painful dental procedures, but if you have a highly qualified family dentist in Toronto, then they will ensure that your procedure is handled professionally by the right individual, making it less dreadful. If you are not sure whether you may need a root canal treatment, there are certain root canal symptoms, like infection, to look for. The number one symptom of a possible root canal infection you should be aware of is either chronic intense pain in the root of the tooth or short intense bursts of pain in the root of the tooth. If you are experiencing either one of these, you should mention this to your family dentist in Toronto or the GTA right away. They will either be able to treat the affected tooth themselves or they might have to refer you to a root canal specialist, also known as an endodontist, depending on the shape of the tooth and the difficulty of the root canal treatment procedure required. A root canal treatment is usually required if the tooth has suffered an injury or if the root canal (the pulp chamber) becomes infected. There are several steps involved in a root canal treatment procedure, and sometimes it could take several trips to the dentist for the procedure to be completed. First, the dentist freezes the tooth so that you do not feel any pain or overwhelming discomfort. Then they drill a tiny hole into the crown of the tooth, creating a passageway to the root canal. The next step is to remove the infected tissue from within the tooth and thoroughly clean the entire area of the pulp chamber, removing all debris. Next, the canal is filled immediately with a material called gutta-percha, which helps keep the area sealed and free of further infection. The tooth is then reconstructed by placing a temporary filling on top of the gutta-percha to hold it in place and then a cap is placed on top of the tooth once it has fully healed. Sometimes, an additional post is placed beside the gutta-percha to reinforce support for the crown and help it stay in place right before the crown is fully and permanently sealed. The last step in the root canal procedure, which is placing the crown over the tooth, can only take place after the tooth has had some time to heal, which could be anywhere from a few days to a few weeks or until your next dental appointment. Until then, it is important to take special care of the affected tooth and adhere to certain rules to ensure the exposed tooth is allowed to heal. You may try to avoid chewing food on the side of your mouth where the root canal treatment procedure took place. Following the procedure, the inner tooth structure will never be as strong as it once was and is more likely to break. Also, if any portion of the temporary filling is lost all kinds of debris may get in there and this will cause the pulp chamber to become inflamed or infected again. Chewing on the tooth in its weakened state can also cause it to crack or split, which will result in the permanent extraction of the tooth because at that point it cannot be saved. You should also brush and floss with caution. While you still want to take proper dental care of the tooth during the healing process, make sure you brush and floss gently and do not force the floss between your teeth. You can take oral pain or anti-inflammatory medication if necessary to help ease any pain, but make sure to be aware of a normal level of pain or discomfort versus what may actually require medical attention. If there is any ongoing pain or other issues throughout the entire healing process, contact your local family dentist in Toronto immediately. Princeview Dental Group is a dental care clinic servicing Toronto and the GTA. We provide root canal treatment procedures as well as a host of other dental procedures and dental emergencies. To book a consultation for a root canal treatment, call Princeview Dental Group at (416) 231-4562.